(CNN) -- The World Health Organization raised the swine flu alert to level five Wednesday indicating it fears a pandemic is imminent. 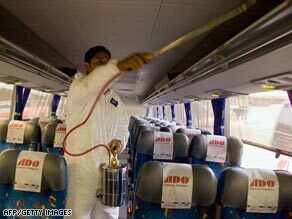 A masked worker disinfects a bus in Mexico City as new cases are reported in the country. On Wednesday, the outbreak grew in terms of confirmed cases, people killed and countries with infections. Health officials are scrambling to get more information about the virus for which there is no vaccine. "All countries should immediately activate their pandemic preparedness plans," said Dr. Margaret Chan, the World Health Organization's director-general. She added: "We do not have all the answers right now but we will get them." Earlier, Dr. Anthony Fauci, director of the U.S. National Institute of Allergy and Infectious Diseases, said: "It's a virus that we've never seen before. There's no background immunity in the population and it is spreading from human to human, all of which has the potential for a pandemic." iReport.com: Do you think we should be worried about swine flu? Germany and Austria became the latest European countries to report swine flu on Wednesday, while the number of cases increased in the United Kingdom and Spain. There are 148 confirmed cases in 11 countries, the majority in the United States, according to the WHO and national governments. Those figures include seven deaths in Mexico and one in the United States. That number includes the country's first swine flu fatality: a 22-month-old child from Mexico who died of the illness at a Houston, Texas hospital on Monday. President Barack Obama called on schools in the United States with confirmed or possible swine flu cases to "strongly consider temporarily closing so that we can be as safe as possible." More than 2,700 other patients worldwide are believed to be suffering from the virus. "It's clear that the virus is spreading, and we don't see it slowing down at this point," said Dr. Keiji Fukuda, assistant director-general of WHO, at a news conference. The apparent spread of swine flu was not unexpected, CDC acting director Dr. Richard Besser told CNN. "Flu is a very serious infection and each virus is unique, and so it's hard to know what we're going to be seeing," Besser said. "But given what we've seen in Mexico we have expected that we would see more severe infections and we would see deaths." The United States is taking precautionary measures to stem the spread of the disease, of which most cases are not severe. U.S. Homeland Security Secretary Janet Napolitano said Wednesday that the federal government would be releasing nearly 13 million doses of antiviral medications to try to stem the spread of the virus. Health officials stress the medications are only effective if taken in the early stages of the infection. In the meantime, scientists are working on developing a vaccine with hopes of having a pilot version ready for testing in a few months, Fauci said. Mexican authorities believe they may have found "patient zero" in the global outbreak in the small village of La Gloria in the mountains of Mexico. Five-year-old Edgar Hernandez -- known as "patient zero" by his doctors -- survived the earliest documented case of swine flu in the current outbreak. He lives near a pig farm, though experts have not established a connection between that and his illness. Edgar has managed to bounce back from his symptoms and playfully credits ice cream for helping him feel better. Researchers do not know how the virus is jumping relatively easily from person to person, or why it's affecting what should be society's healthiest demographic. Many of the victims who have died in Mexico have been young and otherwise healthy. The deadly outbreak in Mexico has prompted authorities to order about 35,000 public venues in Mexico City to shut down or serve only take-out meals as health officials tried to contain spreading of the virus. Swine influenza, or flu, is a contagious respiratory disease that affects pigs. When the flu spreads person-to-person, instead of from animals to humans, it can continue to mutate, making it harder to treat or fight, because people have no natural immunity. Symptoms include fever, runny nose, sore throat, nausea, vomiting and diarrhea.